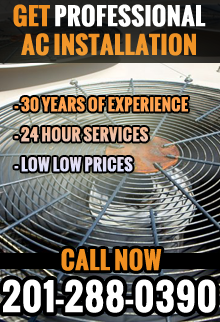 Are you looking for air conditioning installation in Hudson County, NJ? 1st Choice Plumbing, Heating & Drain Service specializes in air conditioning installation in Hudson County, NJ. We are a fully licensed and bonded HVAC company with many years of experience resulting in a high level of client satisfaction. Just when you thought the cold weather would never end and you've begun living in your winter coat, you wake up one day sweating and realize you haven't even unpacked your shorts yet. Such is life living with fast changing New Jersey seasons. If you are like most homeowners, you are not exactly thinking about replacing your AC unit until the need is already there. When you are uncomfortable in the heat you become less productive, experience higher levels of stress, and a lower quality of living. You deserve to feel comfort in the home or office. To make the hotter months more enjoyable for your family or employees, let 1st Choice Plumbing, Heating & Drain Service perform expert AC installation without delay. Instead of purchasing a few window units for your home, our air conditioning installation experts will work with you to provide your family with a cooling system tailored for your home. By installing a high quality air conditioning unit, you are guaranteed to be reaping the benefits of a climate controlled home for many years to come. Likewise, allowing our professionals to find the right fit for your home means that your AC will be more efficient and actually help you save money on monthly energy bills. Whether you are interested in installing an AC unit for your home or your office, our friendly and knowledgeable technicians can help you. If you have preference regarding which brand of AC unit is right for you, we can make sure we install which best suits your needs. Whether you need an AC fit for your home or for a commercial building, 1st Choice Plumbing, Heating & Drain Service can help you. Do not spend another night uncomfortable and unable to sleep because of the heat. Our AC technicians are available 24 hours a day and 7 days a week to keep you happy during the hot summer months. To find out more about air conditioning installation in Hudson County, NJ, call 1st Choice Plumbing, Heating & Drain Service at 201-288-0390.